When you ask any outdoorsman about the thrills of ice fishing in winter, they will gladly tell you about their times out doing what they enjoy. Each adventure is as individual as the person telling the story. However, if you ask a group of outdoorsmen about the drawbacks of ice fishing during winter, each will reply with the same answer: Staying warm by stopping cold feet and hands. Keeping warm while you are outdoors is very important. Hunters exposed to the weather for too long without the proper cold weather gear can find themselves in a world of hurt and problems. Essential cold weather gear to stay warm outdoors includes items for your hands and feet, both of which can easily succumb to the weather. This is especially true when you are perched in a tree stand and your hands and feet are not moving about and keeping warm. The ICEBREAKER® HANBLANKET® insulated hand muff offers the perfect solution to cold hands. Constructed of a tough poly/cotton outer-shell, a soft quiet acrylic pile lining and insulated with a layer of 2-ply 300 gram insulation. The HANBLANKET® muff is ideal for ice fishing as well deer hunting, duck hunting, turkey hunting, or sporting events. An elastic opening at both ends of the muff helps to keep the cold out and the heat in and makes for virtually noiseless hand insertion and removal. 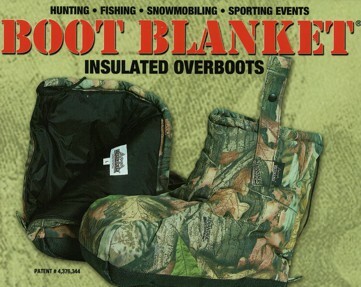 BOOT BLANKETS® are especially important to anyone that intends to engage in Ice fishing activities that keep them still for extended periods of time. BOOT BLANKETS® slip over any type of shoe or boot. They have 2 layers of insulation surrounding the entire foot, not just the top or sides. The interior of the boot also has water repellent, making these boots ideal for ice fishing and snowmobiling. Keeping warm while you are out enjoying ice fishing will ensure that you can enjoy yourself for longer periods of time while remaining healthy. You need the ICEBREAKER® HANBLANKET® and BOOT BLANKET® as part of your outdoor gear. You do not have to hide indoors during the winter. You do not have to give up your favorite past times due to the cold. All you really need to do is make sure that you have the essential cold weather gear to stay warm ice fishing and you will be set for winter time fun.